Odontoid fractures constitute 9%–15% of all cervical fractures. The prevalence of developing of the neurological damage has been reported as 2%–27%, and in patients who develop neurological damage, the risk of morbidity and mortality is predicted to increase. Type II odontoid fractures cause most commonly to vertebral column instability, and open reduction using transodontoid screw is usually recommended through the anterior cervical approach. Klippel–Feil syndrome (KFS) is defined as a congenital fusion anomaly of two or more cervical vertebrae, and at least half of the patients with this syndrome are determined to have a short neck, low hairline, and restricted neck movements., In the majority of KFS patients, it has been reported that the possibility of odontoid fracture after cervical injury is greater in these patients than in normal individuals. The case is here presented of a KFS patient who developed type II odontoid fracture after cervical injury and was treated with fixation with a C3 transodontoid screw. A 56-year-old female patient was evaluated following a traffic accident while in the vehicle. She was conscious without motor deficit and complained increasing pain on movement with advanced degree of restriction in neck movements. She had a short neck with low-set hairline. Cervical computerized tomography (CT) scan revealed type II odontoid fracture on the C2 vertebra and congenital fusion anomaly (KFS) between C2 and C3 vertebrae [Figure 1]. In the patient history, there had been previous restriction in the neck movements and a feeling of tingling and numbness in all extremities with flexion movement of the head. C2 transodontoid screw application via anterior cervical approach was planned to provide cervical stabilization. Right paramedian vertical incision was made in the supine position; the platysma and deep muscles were retracted with blunt dissection, and the C2 vertebra was visualized under fluoroscopy. However, it was seen that it would not be possible to reach the anteroinferior part of the C2 vertebra through this surgical entry, and it was considered that the C3 vertebra was not too distant from the fracture region because of the C2–C3 vertebra fusion anomaly. Therefore, under fluoroscopy guidance, an odontoid pulling screw was advanced from the anteroinferior section of the C3 vertebra toward the odontoid process successfully [Figure 2]. In the early postoperative period, her pain decreased significantly. 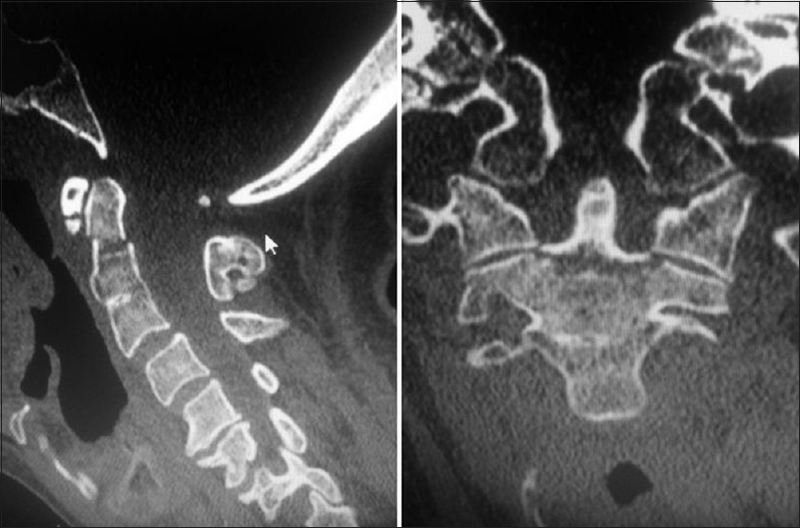 On cervical CT imaging, the fracture lines had not come together at the desired level, but the screw was observed to be completely in the desired location [Figure 3]. The patient was discharged with the recommendation to wear a neck collar for 1 month. At the 3-month follow-up examination, the complaints of the patient had almost completely recovered, and it was observed in the radiographic examination that fracture line was completely closed, and fusion had formed [Figure 4]. In the literature, fixation with transodontoid screw has been the first option in the surgical treatment of type II odontoid fracture. Subach et al. treated 26 patients with the anterior screw technique for acute type II odontoid fracture and reported a success rate of 96%, with a very low rate of complications and a high rate of fusion obtained. They concluded that as the anterior single screw technique applied to the odontoid process would be more simple and could lead to fewer complications, the approach using this method should be the first preference. Despite some advantages of the anterior approach in the cervical region, the approach to the upper cervical region is not always possible in some patients. Especially in patients with a congenital vertebral development anomaly such as KFS and/or who are obese, it may not be possible to reach this space. Therefore, alternative treatment options and approaches have been developed. In the current patient, the management was planned with the application of a transodontoid screw through the anterior cervical approach, but with the finding of a short neck in the patient, the C2 vertebra corpus could not be exposed with this approach. However, C2–C3 vertebra fusion anomaly which shortened the vertebral column space was evaluated as an advantage, and it was concluded that it could be possible to advance the screw to the odontoid process over the C3 vertebra corpus, and although the fracture lines could not come together at the optimum level, the technique was applied successfully. To the best of our knowledge, there is no previous report in the literature of a similar application. In the long-term follow-up, the fracture line in the odontoid process was determined to have fully healed, and fusion was completed. Thus, it was concluded that this surgical approach and technique can be applied safely in these types of patients. Mac Millan and Stauffer stated that the odontoid projection is more sensitive to trauma in vertebra fusion anomaly in this region, because of the increased pressure and excessive loading during hyperflexion and hyperextension of the head. 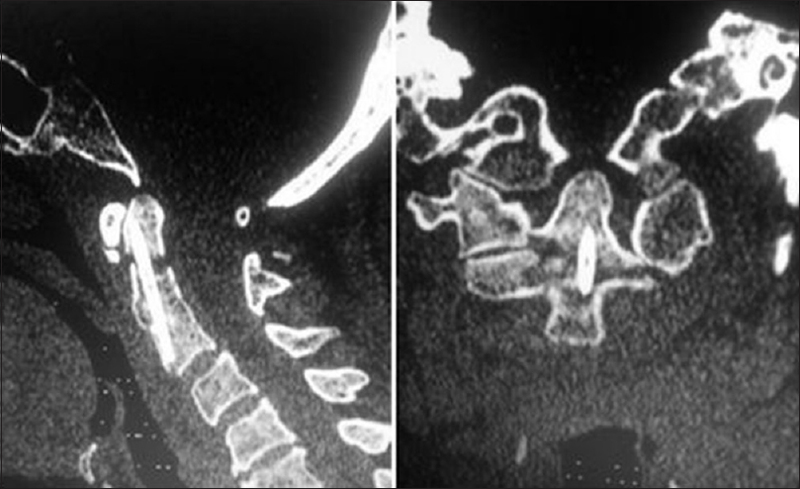 The controversial findings in literature are supportive in nature of the current patient, where type II odontoid fracture was determined following trauma with an existing C2–C3 vertebra fusion anomaly. Because of a short neck, transodontoid screw application through the anterior cervical approach may be difficult in patients with type II odontoid fracture and KFS-like congenital vertebra fusion anomaly and/or who are obese. Advancing the screw from C3 to the odontoid process via anterior cervical approach should be evaluated as an alternative treatment option in such patients. Vaccaro AR, Madigan L, Ehrler DM. Contemporary management of adult cervical odontoid fractures. Orthopedics 2000;23:1109-13. Clark CR, White AA 3rd. Fractures of the dens. A multicenter study. J Bone Joint Surg Am 1985;67:1340-8. Ochoa G. Surgical management of odontoid fractures. Injury 2005;36 Suppl 2:B54-64. Nagib MG, Maxwell RE, Chou SN. Identification and management of high-risk patients with Klippel-Feil syndrome. J Neurosurg 1984;61:523-30. Ulmer JL, Elster AD, Ginsberg LE, Williams DW 3rd. Klippel-Feil syndrome: CT and MR of acquired and congenital abnormalities of cervical spine and cord. J Comput Assist Tomogr 1993;17:215-24. Mac Millan M, Stauffer ES. Traumatic instability in the previously fused cervical spine. J Spinal Disord 1991;4:449-54. Subach BR, Morone MA, Haid RW Jr., McLaughlin MR, Rodts GR, Comey CH. Management of acute odontoid fractures with single-screw anterior fixation. Neurosurgery 1999;45:812-9. Dobran M, Nasi D, Esposito DP, Iacoangeli M. Posterior fixation with C1 lateral mass screws and C2 pars screws for type II odontoid fracture in the elderly: Long-term follow-up. World Neurosurg 2016;96:152-8.